A new smart scan option available from the main console, consistently runs all avast! scanners: antivirus, home networking, software updates and a file collection. The results of these tests are displayed in a common window, so that you can eliminate found problems in one mouse click. 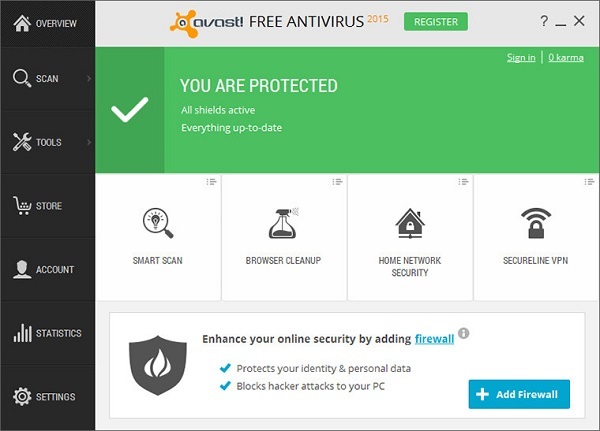 Every antivirus avast! 2015 learned to scan the connection the secure TLS / SSL protocol, to detect threats in any HTTPS-traffic. In addition, the AVAST DeepScan technology can use virtualization based on the equipment to start the process in their own virtual machine, what is isolated from the user’s system in order to increase security and improve detection. Of course, for this hardware virtualization must be maintained by a user’s PC. The Paid Products of the company of the 2015 line supplemented by component SecureDNS – own DNS-system AVAST, which helps to protect the user from intercepting DNS when working over insecure network. To owners of paid licenses also provided convenient support mechanism which automatically adds for AVAST professionals, key data about the user, as soon as he leaves request. The updates AVAST Free Antivirus 2015, AVAST Internet Security 2015 and AVAST Premier 2015 are already available for download and purchase. Visit blog.avast.com to learn more and download.